My goal was not to fall in — especially so close to the dock where a group of curious onlookers attentively watched my stand-up paddle-boarding attempts on the lake at Red Canyon Lodge. It was a make-or-break moment as I rose up from my knees, first to an awkward squatting position and then slowly to full extension. I was shaking as I stood on the board, legs quivering like jelly and hands clenched in white knuckle fashion around the paddle. Then I began to move, trying to remember to retain a slight bend in my knees, to keep eyes focused ahead and alternate paddle strokes from side to side. It was slow going initially, as I didn’t trust my balance nor the board’s stability, and I felt like a frozen statue. But gradually I started to loosen up as I gained confidence in my skills. Though I never quite reached that Zen moment of becoming one with my paddle, I did, however, feel proud of my accomplishments and excited to learn a fun, new sport. Stand-up paddleboarding is just one of dozens of activities visitors can experience while exploring Sweetwater County, Wyoming. To many, this area is relatively unknown in comparison to the state’s more popular destinations of Yellowstone and the Tetons. What people don’t realize, however, is that this hidden gem is an all-ages adventure playground, ripe for discovery. You can easily get your history fix at the Rock Springs Historical Museum and the Sweetwater County Historical Museum in nearby Green River. There you’ll find exhibits on everything from coal mining and the Union Pacific Railroad to early settlers and notorious outlaws, like Robert Leroy Parker (most commonly known as Butch Cassidy), who journeyed through the area over the years. 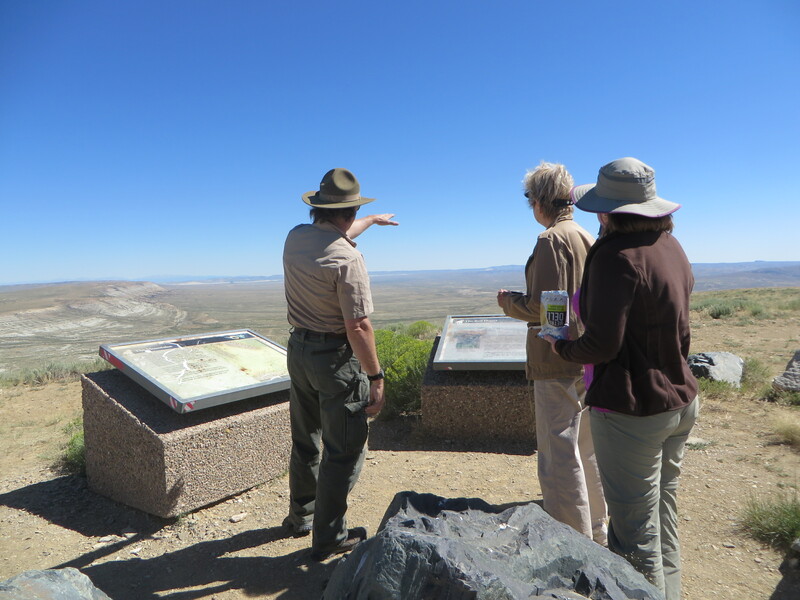 Or, you can set out to discover remnants of bygone days as you explore the surrounding region with its numerous historic pioneer trails, fossil beds and petroglyphs. 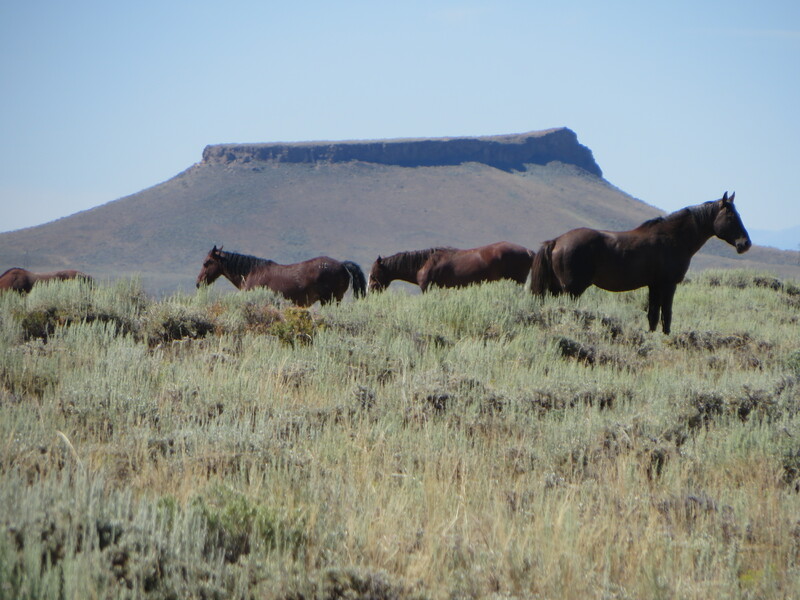 One of the highlights of Sweetwater County is getting to see the wild horses that make their home in this corner of the state. These beautiful creatures run free and untamed, reminding visitors that the frontier spirit is still alive and well in our country. 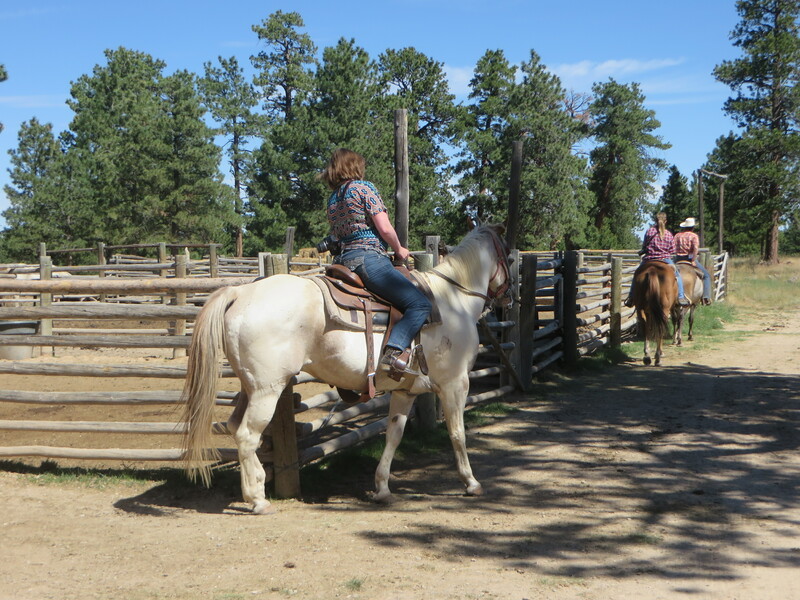 Though you can drive the Pilot Butte Wild Horse Scenic Loop on your own – a 23-mile route on an often rough road (reliable transportation is a must!) – the best way to view these magnificent beasts is via a guided excursion with Green River Wild Horse Tours & Eco Safaris. Owner and guide Rich Nobles has extensive knowledge of the wild horses, as well as of their history and the high desert country they inhabit. 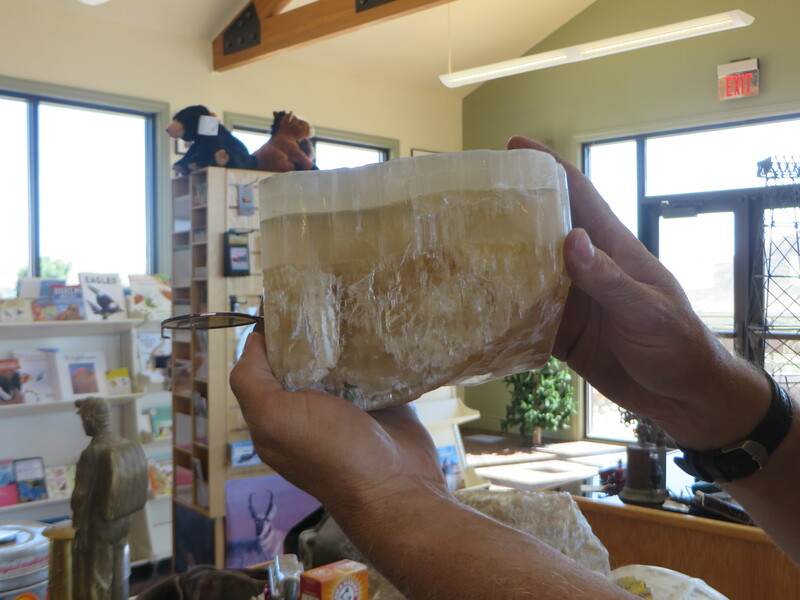 Not only will you be able to see the horses and possibly other creatures such as pronghorn, coyotes, mule deer, hawks, eagles and more in their natural environment, but you’ll get a real taste of the scenery. Impressive vistas surround you at every turn as you navigate through a stark and unforgiving landscape of sandstone, shale, sagebrush and buffalo grass, dominated by White Mountain. 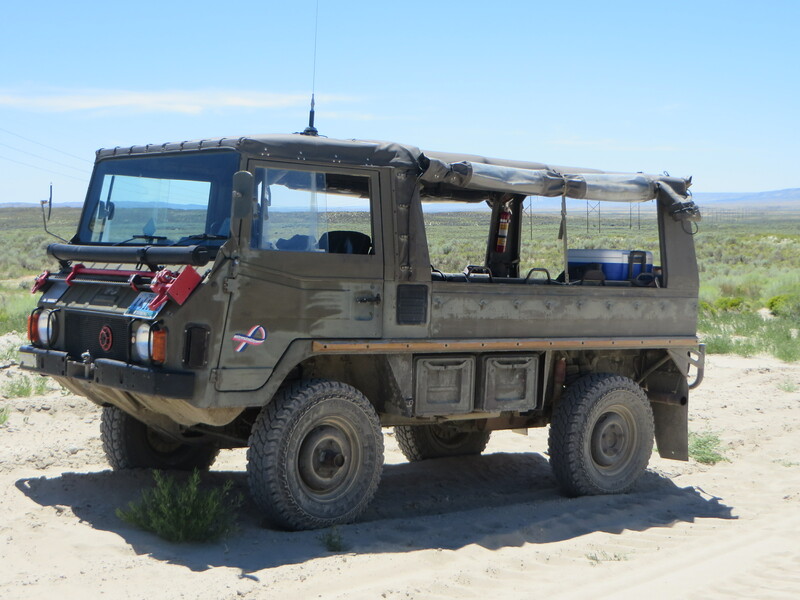 Nobles drives an Australian made Pinzgauer, or as he calls it, an “SUV on steroids.” It’s a rugged safari-style vehicle with open air capabilities that allow passengers to get the best possible view of their surroundings. Some of the finest views in Wyoming are located along the Wild Horse Scenic Loop, with several panoramic overlooks of the area’s prominent features, such as Pilot Butte, a distinctive navigational landmark and Boar’s Tusk, a 400-foot-tall volcanic spire that acts as a sentinel to the vast Killpecker Sand Dunes. The Wyoming, Wind River and Uinta mountain ranges are also on display, along with the Overland Trail and Union Pacific Railroad corridors. You’ll be taken off-road, up and down steep embankments, as you keep an eye out for the horses and any other animals that care to make themselves visible. Meanwhile, Nobles will regale you with interesting facts and a collection of colorful tales. Never one to shy away from a controversial subject, he will also inject his personal and passionate opinions about the politics of the wild horse management situation and various environmental issues. When the horses are spotted, there’s palpable excitement from the group. Nobles tells us that the herd is a mix of different breeds, from thoroughbreds and quarter horses to Morgans and Curly horses. We keep our distance, not wanting to spook them, as we take ample opportunity of this marvelous Kodak moment. Later, we spy a pair of old bachelor stallions making their way down to a watering hole. And then there’s another group on a nearby hillside, which Nobles explains is actually comprised of several small clusters, each consisting of a stallion and his mares. Towards the latter part of our excursion, we come across a grouping adjacent to the road. 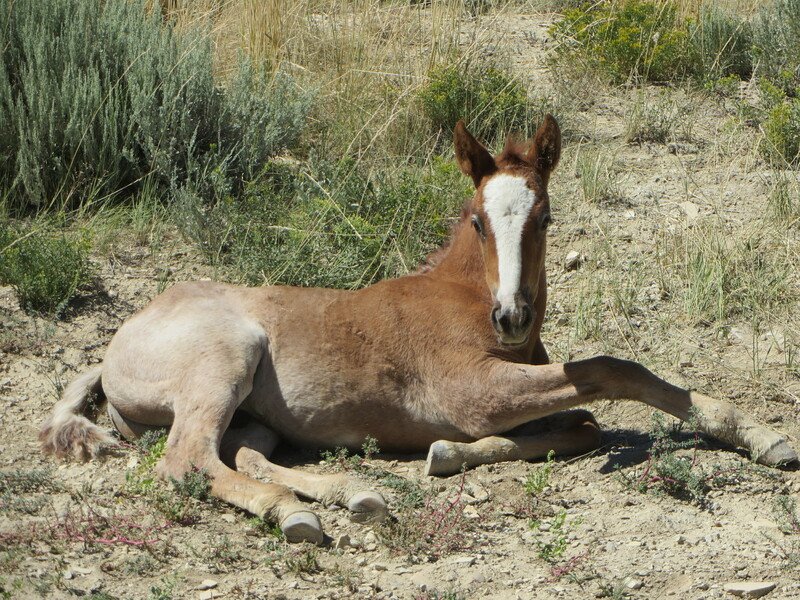 A few of the horses surround a small colt that is lying on the ground, protecting her as elephants do with their young. They part and move on to graze, and we get a full look at the little one before it rises in ungainly fashion and scampers off to join the others. At Killpecker Sand Dunes, we marvel at one of nature’s largest sand boxes. Created via a combination of volcanic action and subsequent wind erosion, the dunes can reach heights of over 100 feet and run for over 100 miles from west to east. They are traveling sand dunes, constantly on the move, which gives the vegetation in this environment a real challenge. For recreation-seekers, the dunes provide a soft terrain suitable for a myriad of activities such as hiking, sand surfing or an unforgettable match of beach volleyball. If you’re lucky, you might spot the herd of rare desert elk that roams across this unique landscape. Nobles also includes a stop at the White Mountain Petroglyphs during our daylong tour. It’s an opportunity to see ancient artwork carved by the ancestors of present Plains and Great Basin Native Americans. The petroglyphs, of which there are hundreds, include drawings of elk, buffalo, horses, teepees and human figures. Many date to early times, about 200 years ago; others appear to be older and are estimated to be as much as 1,000 years old. Nobles shows us a particular section of the rock with marks that appear to be hand holds. 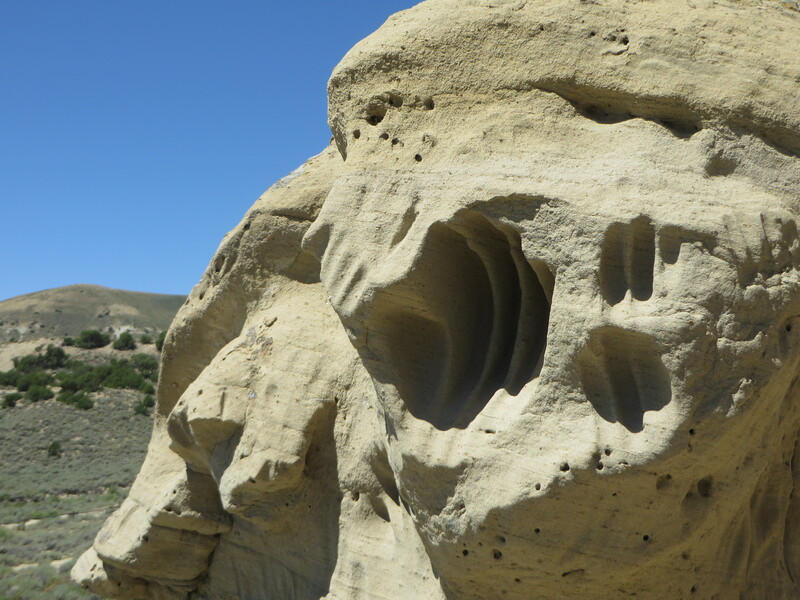 He notes a possible explanation for these indentations, telling us that Native American women might have created them during the childbirth process. 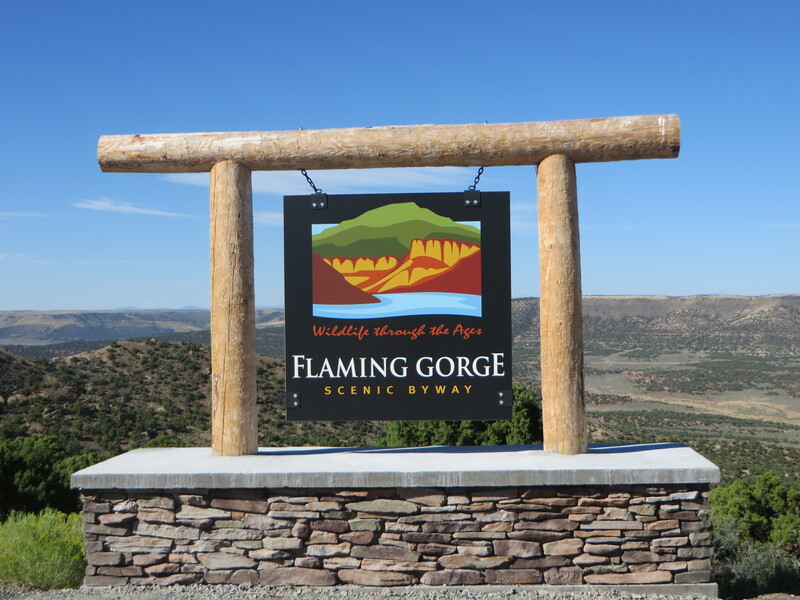 Another major highlight of Sweetwater County is Flaming Gorge. To get there, take the Flaming Gorge Scenic Byway, one of the most scenic routes in the country. The drive traverses a wide variety of dramatic landscapes from the high desert plains to the upper elevations of the Uinta Mountains. It encircles the 91-mile-long Lake Flaming Gorge, crosses verdant forests and vast canyons carved by the Green River. 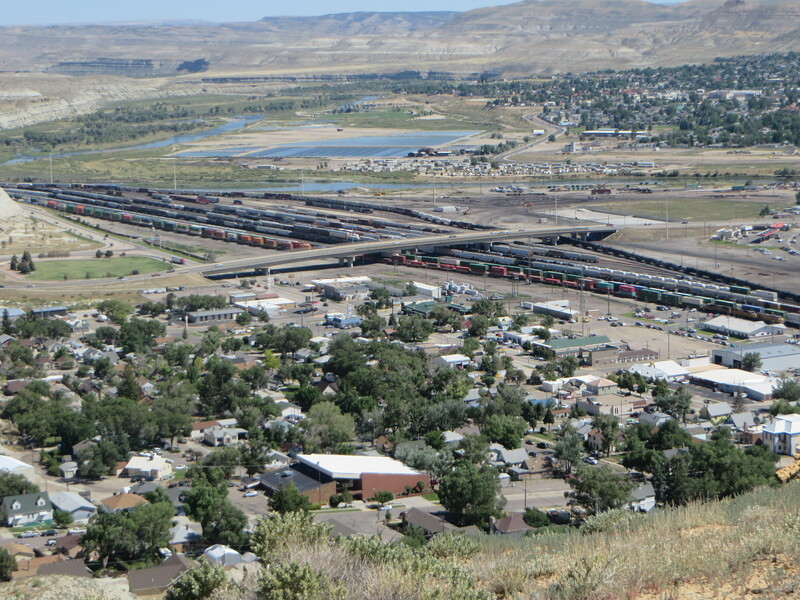 Most of this picturesque area is in Wyoming, with only a small portion lying in neighboring Utah. Designated a National Recreation Area, Flaming Gorge is rich in wildlife and Western lore, and serves as a grand outdoor play arena, minus the crowds. If water is your milieu, you’ll be in heaven, whether it’s on an exciting raft trip or a leisurely boat excursion. Traveling from one end of the lake to the other, you’ll pass through sections with stunning rock pinnacles and long stretching beaches. As you make your way towards the south end, there are winding canyons with vibrantly-hued cliffs and lush forests. Big horn sheep graze the hillsides and scale the steep walls of the canyon, giving visitors pause as they stand in awe of these nimble creatures. As for anglers, this area offers one of the most diverse fisheries in the world, with hundreds of waters within an hour’s drive of the gorge. It’s a trophy trout destination, known for setting state records for Lake, Rainbow and Brown trout. And let’s not forget about the Green River, below the Flaming Gorge Dam, which is also regarded by fishermen as trout heaven. If you’re hardy enough to come in the dead of winter, you’ll even be able to do some ice fishing! Hikers, take heart, as there are miles of trails to give you a sense of the grandeur of the Flaming Gorge. One of the more popular walks is along Red Canyon Rim, where you’ll get great views of Red Canyon, a 1,700-feet-deep gorge carved by the Green River eons ago. The route follows the south side of the rim, providing many spectacular overlooks of the lake below. It’s easy to become mesmerized by the contrast between the red walls of the canyon and the blue/green color of the lake. Make sure to stop in at the Red Canyon Visitor Center, with its frontier history and wildlife exhibits, as well as its free interpretive programs for kids and families. Perched high upon the rocky cliffs of the gorge, the facility offers a million-dollar view of the immense canyon. There are plenty of places to camp in and around the Flaming Gorge, as well as a number of lodges for those wishing additional comfort. Red Canyon Lodge, where I had my stand-up paddleboard experience, is a top-rated establishment with a dose of rustic charm, offering private cabins, fine dining and plenty of activities to please all tastes and ages. The log cabins are custom-built and handcrafted, situated on the lodge’s peaceful lakeside setting. Some folks simply sit on the porch content to gaze at the scenery during their stay, while others are active from dawn to dusk, taking advantage of the fishing and boating opportunities on the private lake or heading down to the stables for a trail ride. The lodge rents all sorts of gear, including assorted watercraft and mountain bikes. Clientele ranges from empty nesters to families, many who make their pilgrimage to the place year after year. It’s definitely a kid-friendly environment, where little ones have their own fishing hole to haul in a “big one” just steps away from the on-site restaurant with its made-for-children meal options. Though it’s the wow factor that certainly impresses visitors to Sweetwater County, it’s also the opportunity the area offers them for rejuvenation and peace of mind that is of equal merit. Most important, however, it’s a place where treasured memories can be made.